7 Fashion Tips You Can Follow To Make Your Clothes Look Expensive! There are many things that money can’t buy. You can buy clothes but not style, you can buy expensive shoes but not always make them look like it. This also works the other way around. You can have style and not expensive clothes, you can be a trendsetter and still wear a T-shirt you got from the thrift store. It all depends on how you style yourself and present yourself to the world that really matters! With little touches, you can really make an impact with your looks. Here are 7 things you should avoid if you want to make your clothes look expensive than they are! Colours make a person look bright and fresh, but clashing too many colours in one ensemble can only make you look a little over the top (read: tacky). If you are into color blocking, always stick to a maximum of two colors with no prints. Wear a bright orange top over blue bottoms, but wearing the same orange with printed trousers will only drag your look down. Choose rich colors like maroon, navy or violet. Unnecessary loud prints in your clothes is not a good idea if you want to look sophisticated and elegant. Stick to prints in neutral colours and stay away from prints on bright coloured fabric. Neutral prints are a classic and will never go out of style. Invest in these items of clothing rather than spending money on bright printed tops or dresses. No time to iron? Might as well not wear that piece of clothing and opt for a fabric that does not get crushed easily. 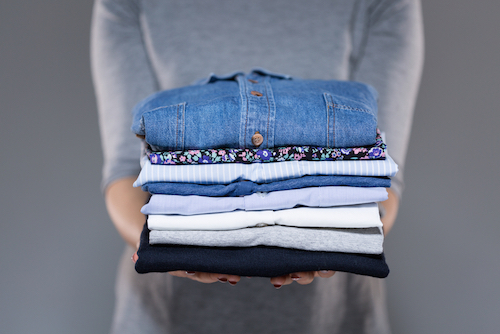 Wrinkled clothes not only make you look untidy but they also make your clothes look cheaper even if you might have spent a decent amount of money purchasing them. Respect the clothes you spent money on and always find time to iron them before heading out. Do not avoid that visit to the tailor for alteration if you must. Ill-fitted clothes make you look sloppy and untidy. Wearing oversized sweaters and shirts is a trend, but always make sure to balance it out by wearing a tight bottom with a loose top. Dresses with the wrong fit and huge tops that do not fit will do nothing for you except to make you look like one of the hangers in your closet. Streamline your look with a belt if you really want to look good in oversized clothes. Sequins look pretty when you’re headed to that party or a night out with your friends, but wearing them a tad too much during the day? Not a good idea. Avoid clothing items with too much bling on them during the day because they will only make you look unnecessarily flashy and draw unwanted attention. Logos are a brand’s way of connecting to the world, and while you might be more than happy to have purchased something from that expensive brand you have always loved, you need no to shout it out with a huge logo on your T-shirt. There are a lot of fakes in the market that is doing that nowadays and one might mistake that top for a cheap rip-off. Simplicity is the ultimate sophistication.